The Expendables (2010, Stallone) is a reactionary movie in which a cast of pigs must go ‘behind enemy lines’ into the Third World. The plot was minimalist, and the characters, all played by big-name action stars, were largely forgettable. Despite this and in no small part because of its ultra-reactionary message, The Expendables debuted number one in Amerikan theaters, grossing 17 million dollars in tickets sales on its opening weekend. In the movie, Sylvester Stallone accepts a contract from the CIA and leads to small band of mercenaries to the fictional Latin American island-country of Vilena. There, a rogue CIA agent rules via proxy and profits greatly from the production of illicit drugs. On a reconnaissance mission, Stallone and his partner are discovered, resulting in a high speed chase and the outing of their contact on the island, the daughter of a puppet general who nominally rules the island. Ostensibly because Stallone feels bad about putting the general’s daughter in danger, he and his team return to the island to finish the job. After killing what seems to be hundreds of soldiers and blowing up the presidential palace, Stallone and his crew succeed in killing the rogue CIA agent and his henchmen. Rather than keeping the contract money, Stallone gives it to the general’s daughter before bidding her farewell. The general message of the movie is not that ‘Amerika saves the day’ or ‘Amerika always wins,’ though both of these elements were present. 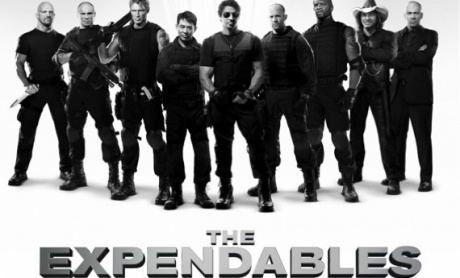 Rather, the message behind The Expendables is that it is inconsequential and even heroic to travel to Third World countries, killing nameless, faceless brown people and causing untold destruction. The movie is one of tacit hate towards Third World peoples. Other aspects of the movie are also problematic. Besides the general’s daughter, the only other prominent female is the girlfriend of a ‘protagonist’ character played by Jason Statham. She seems drawn to controlling and abusive, yet emotionally-distant men. She leaves Statham’s character for another man who physically abuses her, and returns to the ‘protagonist’ after he beats up the new boyfriend and his friends. The general’s daughter herself never acts as an independent agent. In both cases, women are portrayed as helpless, naive and in need of rescue. That said, compared to the above analysis regarding the movie’s view towards the Third World, this is a minor issue. In fact, the First World often cynically raises gender issues in its attacks on Muslim and other Third World countries. If the mercenaries were traveling to Iran or Afghanistan, for example, we imagine the film would have included stronger women ‘protagonists’. The portrayal of people of color is also questionable. The main non-White protagonist is played by Jet Lee, a Chinese martial arts actor. Jet Lee’s character is docile. Throughout the movie he asks for a pay raise and it is implied he makes less than his colleagues. These requests are met with annoyance and dismissal. He’s portrayed as contributing less to the team’s success. Jet Lee’s character helps promote the Amerika’s ideal oppressed national: subservient and loyal, yet marginalized. The most prominent people of African descent throughout the movie are a group of pirates in the opening scene. After demanding more ransom money, Stallone’s mercenary team massacres them. One ‘protagonist’ character, played by Dolph Lundgren, attempts to hang one of the African pirates but is stopped by his teammates. Though the scene opens a mini-arc revolving around the character’s fall from grace and reform, the racist undertones are apparent and shocking. The mercenary team does include one Black guy, but his role is marginal at best. The portrayal of men is also extremely one-sided. They are shown as fighters: big muscles, gun and knife toting, ready for action, etc. In some scenes, contrived dialogue is supplemented with hulkish, contrived poses. The Expendables, though hardly alone, helps promote an imagine of men as warriors whose main value is being able to kill, harm and intimidate those Amerika is set against. The imperialist media often hypes Third World culture which explicitly (and rightly) promotes hate against the oppressor. However, movies such as The Expendables promote an implicit hate of the Third World and its broad masses. The drama and petty motivations of a handful of pig mercenaries is shown as significant whereas the Third World people they rampage through are not. No moment is paid to question what happened to Vilena after the mercenaries leave, though the movie supposedly ends on a happy note as all the conflicts amongst the pigs seem to be resolved. In short, according to the movie, Third World people are worthless and Amerikan pigs are valuable. While it’s not as direct as the revolutionary slogan, “Hate Amerika,” the reactionary message presented by movies such as The Expendables opens the door for great violence to be inflicted up the majority, Third World masses. Like much of Amerikan culture, The Expendables has nothing to offer revolutionaries and the new world we seek to create. Along with Amerika itself, movies such as The Expendables will be swept away, perhaps viewed most often by and studied by academics, who will remind future generations just how chauvinist, militarist, hate-filled and reactionary Amerikans really were.